"In the morning, after breakfast, His Majesty (King Rama V) went to the Chakri Maha Prasat Throne Hall. He tied sacred strings around the four elder brothers, poured holy water on them and fingered powders on their forehead (a sacred symbol for luck and happiness). The King then lead the princes to Prince Pavares to tie sacred strings. Pra Chaiya Watana, the Holy Monk, tied holy strings around their neck. They all then went down to the Pae Villa (by the Chao Praya river). His Majesty gave them blessings, and wished that they leave (Siam) with happiness in their hearts, and remember his teachings. The King invited the female members of the royal family to also be present, and that the princes said goodbye to their mothers, only Mae Uam (Chao Chom Manda Uam, mother of Prince Kitiyakara) wasn't there. At about 9am, the King went down to the ship, Soponpakavadi, to see the princes off. He hugged and kissed all of his four eldest sons. He stood there until the ship was out of sight, and then came back up. There were many elder royals who went on the ship with the four princes. There were also many royals and aristocrats who came to the Pae Villa to see them off, including Mother (Queen Savang) and Aunt (Queen Sri Bajarindra). Many of the royals cried. Then the King came back to the Chakri Throne Hall, and held a lunchoen for the monks. Then there was a procession of the Buddha's Relics that Pra Subhuti, a monk from Sri Lanka had sent from India. He said that these relics are real. His Majesty sent me to fetch Tongbai to come and wrap up the relics and put on the ivory pedestral on the Throne in the Chakri Hall. There was a prayer session that night, and a firework afterwards. His Majesty told me to light them. Went to sleep at 10pm." 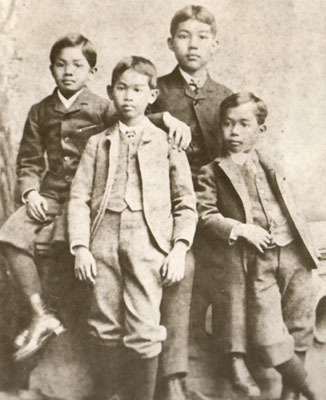 HM King Chulalongkorn thought that his children should study in Europe, as it was time to bring Siam up to the standard of the Western World. It was also a way of gradually making friends with the European Royals, as well as to bring back information and technology to better his kingdom. His four eldest sons were the first to be sent to schools in England and France. Later, the King's other sons were dispersed to many European countries, and he himself visited Europe twice during his reign. 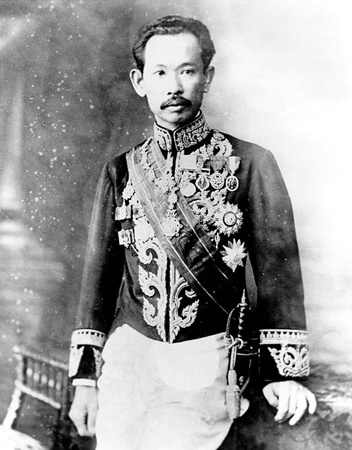 (1) HRH Rabi Badhanasakdi, Prince of Rajaburi, was born on 21 September 1874, 14th son of King Rama V and youngest son of Chao Chom Manda Talab of the Ketudat family. 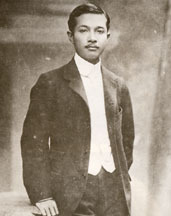 He is known as the "Father of Thai Law." He died on 7 August 1920, at the age of 45. His descendents use the surname of Rabibadhana. 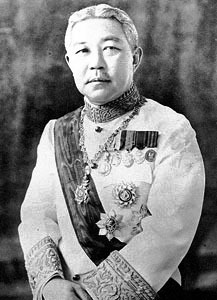 (2) HRH Prince Chirapravati Voradej, Prince of Nakorn Jaisri, was born on 7 November 1876, 17th son of King Rama V and eldest son of Chao Chom Manda Tubtim of the Rojanadis family. 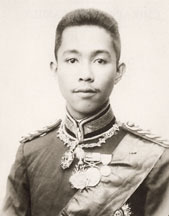 He is known as the "Father of the Royal Thai Army." He died on 4 February 1914, at the age of 37. His descendents use the surname of Chirapravati.